A World War II G.I. newspaper re-created on the Worldwide Web more than seventy years after it's original publication. 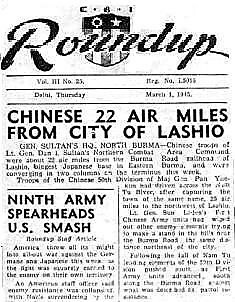 CBI Roundup was published weekly by the U.S. Army Forces in the China-Burma-India (CBI) Theater and was the first Armed Forces newspaper published overseas in World War II. It contained news unique to the CBI Theater as well as news from other theaters and the home front, and sports stories and scores. Many of the stories were written by CBI soldier-correspondents. Between September 17, 1942 and April 11, 1946, there were 188 issues of Roundup published. The paper brought welcome relief to the almost constant boredom faced by off-duty soldiers in the far-off theater, 12,000 miles from home. Due to the distance involved and the relatively few Americans assigned to CBI, it was often referred to as The Forgotten Theater, a label that continues to this day. The web pages are based on the original newspaper, including stories and photos published in the original issues. Original issues of Roundup were provided by CBI Veterans, family members and others interested in sharing the history of the CBI Theater. 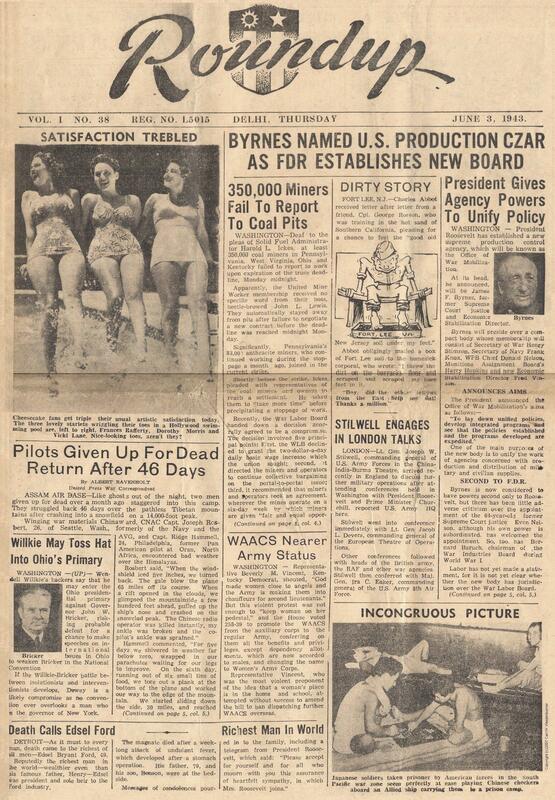 Roundup contained news stories and pictures from CBI as well as other theaters of the war. News from the home front was also included as well as two pages of timely sports stories and scores. All but the first issue featured a page one "cheesecake" pin-up photo (usually a Hollywood starlet). The online pages feature mostly stories and pictures about the CBI Theater. Interesting stories from the home front and World War II in general are included. The CBI Roundup pages join the ever-growing number of web pages about CBI that are part of China-Burma-India - Remembering the Forgotten Theater of World War II web site on the Internet. These pages, along with more created by veterans and others interested in the history of CBI, aim at erasing the Forgotten Theater label by bringing the history of CBI to the worldwide web. For more, see CBI on the Internet. At right is a photo from A Tribute To My Dad showing my father in Assam, India, relaxing with a beer, but what is he reading? Roundup of course! The image above is an upside down close-up from the picture at right. Although the image is blurry, the distinctive masthead is visible in the close-up. 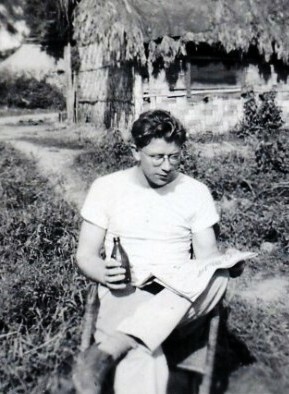 Perhaps in the picture, Dad is reading, seventy years ago, what I am typing today! The technology exists to simply scan an original and publish it to a web page. When the original (document, booklet, photo, etc.) is in good condition, this is fairly easy to accomplish. But what about when the original is yellowed, faded, folded and/or torn? The technology also captures each imperfection. The resulting page would be hard to read, no matter how large it was presented. 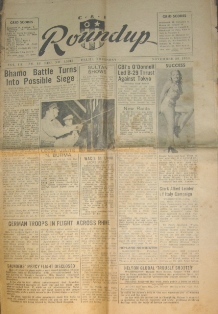 A photograph of the front page of the November 30, 1944 issue of Roundup. CLICK HERE to view the entire page in full screen. CLICK HERE to view a readable-sized portion of the page. CLICK HERE to view the Internet version. I have adapted many original publications into web pages. While each presents its own unique challenge, they all share the above mentioned shortcomings. I decided the best way to present the original is to recreate it for the computer screen while trying to retain the "look and feel" of the original. Imagine reading your favorite newspaper on this computer screen. Your fingers would be busier than your eyes, moving the page up and down, left and right, to read a complete story. Then there is the problem created by "Continued on page...." The newspaper is designed to be held in your hands and read. You can easily move the paper to read a story in an individual column, or open up the paper and glance at two pages at once. The headlines catch your eye and you move the paper to the story you want to read. The computer screen is different. While the newspaper is taller than it is wide, the computer screen is wider than it is tall. What you have then is two rectangular formats, one vertical and one horizontal. In computer "lingo" these are identified as portrait (image taller than it is wide) and landscape (image wider than it is tall). The computer screen favors the landscape format since it is wider than it is tall. So rather than trying to copy the original Roundup, I decided to recreate it. What I do is retype each story. I try to closely match the original headline type using fonts available on the computer. I scan the original photos from the newspaper and then use some basic software to enhance them. This basically involves removing the (yellow) color and adjusting the brightness of the image. Of course the images are grainy and rather poor, but still show what was originally intended. The recreated paper is more easily readable on the computer. Everything flows down from the masthead of the paper to each story and photo. Scrolling down is all that is required. there is no need to move back and forth or up and down to read an individual story in a small column. Many of the headlines featured on the recreated pages differ from those of the original paper. Roundup brought news from around the world to CBI soldiers. Often the headline featured the top news from Europe and the Pacific; others dealt with stories from the home front, including War Department and other government agencies' actions that effected the CBI soldier. A few headlines carried news of baseball's World Series. On the recreated pages, the headline is always a CBI story, often the "top story" from page one, sometimes from page two. 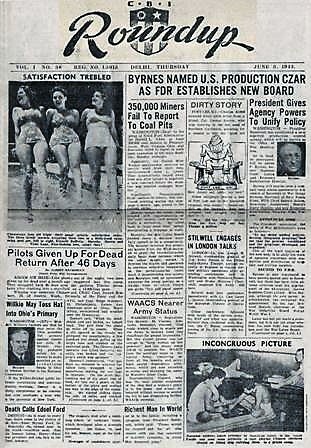 Whatever story was deemed the top story about the CBI Theater in that issue became the lead story, with its title at the top of the paper as the headline. The stories are exactly as written by Roundup's staff or contributors. Each web page contains a bit of the history of the CBI Theater, as it was written over seventy years ago. While Roundup contained news of all theaters of the war, as well as sports and news from the home front, the web pages contain mostly stories from the CBI Theater, with a few interesting stories about non-CBI subjects that were also published in Roundup. Most of the pages have been put through a "spell-checking" process to correct typos that occur in transcribing the stories as well as miss-spelling in the original story itself. In order to preserve the intended look of the web page, which mimics the original newspaper, the size of the page is automatically set to 1025 pixels wide. The height of the page will be the available height of your screen. Changing the page size on larger resolution monitors will cause some images to be distorted. The layout of the page may also be affected. The pages are best displayed using Internet Exporer, although Firefox, Chrome and other browsers should work equally as well. On these browsers some variation of the pages may occur. I like to call the web pages Roundup Online. They are in fact the original newspaper brought to the Internet, or "online." While they allow CBI Veterans to remember their service in CBI, they more importantly bring to the Worldwide Web the history of CBI, written as it happened. Below are three images that illustrate the process involved in transforming pictures from original Roundups into images for the Internet. This scanned image shows what the yellowed 60+ year old original looks like today. The color is removed creating a gray-scale (black & white) image. Restoring the white background makes the image more closely match the original, as it would have appeared during the war. As you read the stories in Roundup, you will come across some unfamiliar and sometimes strange words and phrases. That is, they are strange to all but CBI-landers. By the way, a CBI-lander is a soldier serving in the China-Burma-India Theater. "Uncle Sugar" is probably better known to you as "Uncle Sam." To be completely accurate, the term is Uncle Sugar Able, which means U.S.A. in military phonetics. You may have heard of it, "Able, Baker Charlie, etc." Most often used by fliers, it helps prevent errors by more clearly specifying a word that starts with the letter being spoken. The complete list, common in World War II was: able, baker, charlie, dog, easy, fox, george, how, item, jig, king, love, mike, nan, oboe, peter, queen, roger, sugar, tare, uncle, victor, william, x-ray, yoke, and zebra. There are of course variations. You can use any easily recognizable word to represent the intended letter. You will often see phrases referring to a place called "Shangri-La" in Roundup stories and even headlines. "Shangri-La" is explained in a Roundup story in the March 2, 1944 issue. The name comes from President Roosevelt's response to a correspondent inquiring about where the planes of Doolittle's Tokyo Raiders had come. The President, not wanting to divulge any military information, simply said, "They came from Shangri-La." They of course had come from the United States by way of the carrier USS Hornet. Thus "Shangri-La" was another way to say "the U.S.A." The term is used frequently in Roundup. As you visit the Roundup pages, you will notice that earlier ones are titled "C-B-I Roundup" and later "India-Burma Theater Roundup". Late in 1944 the original China-Burma-India Theater was split in two: the India-Burma Theater (IBT or I-BT or simply I-B) and the China Theater of Operations (CT or CTO). Beginning with the February 1, 1945 issue, the paper took the name of the IBT. The fact is that World War II ended when the Japanese surrendered in August of 1945. Locally it was August 15th and, because of the time difference, August 14th in the United States. Many consider the 14th as V-J Day (Victory Over Japan). Others consider it September 2nd as that is the day the Surrender Instrument was signed, making the war's end official. So why if the war ended in 1945 did Roundup continue to be published into 1946? The overall view is that the war ended with the dropping of the Atomic Bombs. While that is true, it's also true that at that time there were millions of Americans scattered about the world in various theaters and stations. The China and India-Burma Theaters were no exception. There was much work remaining to be done The supply operation that was the IBT came to a halt and then was reversed. Anything surplus had to be sold or returned to the U.S. The process would take months and would require men in theater to perform the associated tasks. As it had done during the war, Roundup reported on the post-war operations and provided entertainment for the men still in theater. For military recordkeeping purposes, the United States considers December 31, 1946 as the official end of World War II. Below is a screen capture of the "finished product," an Internet version of a newspaper published over sixty years ago.